President Trump is threatening a partial government shutdown if Congress does not include $5 billion in partial funding for the purpose of building the border wall that he and Republicans in the House and the Senate have promised for years. A border wall that Democrats Chuck Schumer, Nancy Pelosi, Hillary Clinton, Joe Biden and Barack Obama all voted for in the past and claimed was necessary as recently as 2006. Now all we hear from delusional Democrat hypocrites, and some “Republicans”, is that “Walls Don’t Work”, “It costs too much”, “Walls are immoral”, “Walls are racist”, “Everyone has a ‘Right’ to cross our borders”, etc. 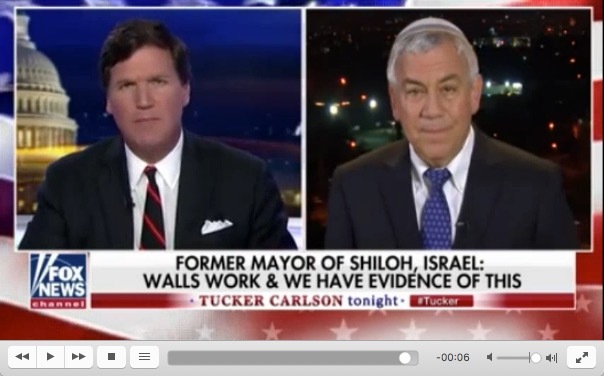 The inconvenient facts are that the border wall in Israel stopped 99% of illegal immigration ; that the one time cost of $25 billion needed to build the wall would actually save billions of our taxpayer dollars per year that are required to “take care of” illegal immigrants once they are in our nation; that building a wall would save thousands of lives of American citizens who die each year from heroin and fentanyl – 94% of which comes across the southern border; that building a wall would stop the tragic deaths of thousands of illegal “people of color” immigrants who die trying to cross the border now, and would stop the child trafficking and crimes committed against American citizens by illegal immigrants once they break into our nation. In the heartland of Ohio, we consider that what the sophisticated folks on the coasts would call “a compelling case” for building the border wall. The reality is that when Ted Cruz forced a government shutdown in 2013 We the People supported him for doing so, just as we support Trump today. It was cowardly “Republicans” who did not support Cruz but the direct result was that in 2014 We the People elected more Republicans to the Senate, resulting in Republicans taking control of the US Senate. That is called winning, not losing, but not if you are in Washington, DC where lies are way more effective than facts. Those same Washington insiders claim that shutdowns cost “billions of dollars” when the fact is that most of that “cost” is paying “non-essential” government employees back wages for the time they did not work during a shutdown. So in effect, the actual affect of a government shutdown is taxpayer-funded paid Christmas vacations for as many as 850,000 already overpaid government employees! Wow that sure sound cruel Speaker to be Pelosi – cruel to US not them! However, in the spirit of Obama crony Rahm Emanuel’s infamous political advice “Never let a crisis go to waste!” we would like to ask President Trump to do what he has done so well as President and use his business acumen during this partial government shutdown. See even the Democrats admit that a government shutdown doesn’t actually shutdown the government since all “essential” services continue. What happens is that “non-essential” government employees are furloughed until the budget is passed. So to those of us who are business owners and President Trump, the glaring question that a government shutdown posses is “Why would any business have any “non-essential” employees?” Seriously, why would any business spend precious resources on employees it doesn’t need other than nepotism. Isn’t that what this really is in our government – nepotism? How many of these “non-essential” government workers are politically connected or family and friends of current and previous elected and non-elected officials? So why not use the pretend crisis of a government shutdown instead of wasting it? President Trump should instruct current Budget Director, soon to be acting Chief of Staff, Mick Mulvaney to order all agencies of the federal government to audit every single “non-essential” government employee job during the shutdown to determine if those jobs could be eliminated. Since they are not needed to keep the government running certainly a huge number of them could be permanently eliminated – which would actually result in a shutdown saving taxpayers money, and in smaller and more efficient government! What a great idea! How much could we save? If 850,000 federal employees get furloughed as “non-essential” during a shutdown, what if we could eliminate even 400,000 of those jobs? Knowing people working in DC it would be very safe to say that each job that was eliminated would save taxpayers at least $100,000 in wages and benefits and thus the President could save $40,000,000,000. That’s $40 BILLION PER YEAR! Now that is the kind of outside-the-box thinking and management we should expect from President Donald Trump and we would support! If the Democrats and RINO Republicans want to play a game of chicken with the border wall funding, why don’t we up the stakes? While they deny We the People our national soveriegnty and national security to please their ruling class masters, and ignore our votes and their promises, how about if we put some of their skin in the game Mr. President? I can hear the swamp creatures thrashing about in those muddy waters along the Potomac at the thought of such a creative solution. “You can’t do that!” they will shout! Well besides chanting “Build that Wall” at the top of our lungs for the past three years, you also heard clearly our shouts to “Drain the Swamp!” Now is the time Mr. President, No wall funding – No government funding! Let’s stand our ground and shut it down and let’s not waste a good crisis when we have the chance to drain the swamp at the same time. Tom Zawistowski is the President of the TEA Party affiliated We the People Convention and the Executive Director of the Portage County TEA Party. He lives in Akron, OH. Akron, OH: Today, Tom Zawistowski, President of the Ohio TEA Party organization, the We the People Convention, and Executive Director of the Portage County TEA Party, reacted to the news that former RNC Co-Chairman Bob Paduchik was picked by President Trump’s re-election campaign to oversee the President’s Ohio campaign for 2020. Paduchik was brought in at the last minute to head up Trumps successful Ohio Campaign in 2016. If you hear anyone tell you that “experts say walls don’t work” to stop illegal immigration, show them this video. Click on this link to read more facts. Please call your Congressman and Senator TODAY and Demand that they fund the Border Wall. Contact your U.S. Senators of the 115th Congress. Please forward this email to others, post this video on your website, and share it on social media. Akron, OH: Today, the Ohio TEA Party organization, the We the People Convention, released the results of it’s Ohio state poll which was conducted on Tuesday, December 11, 2018. The poll surveyed 410 Ohioans to determine the position of Ohio citizens toward the importance of securing our US borders, including building of a border wall, and their degree of support for President Trump’s pledge to “shutdown” non-essential parts of the Federal Government if Congress fails to provide adequate funding for the border wall. The We the People Convention poll showed that 52.91% of Ohioans support the President’s threat to shutdown “non-essential” government if Congress does not fund the border wall in the budget. While 42.78% of those polled do not support a shutdown and 4.31% are undecided. Republicans support the President by 84.52%, while Democrats oppose the President on the shutdown by 78.57%. The survey also found that 68.54% of Ohioans feel that securing the US border was “Very Important” or “Important”, while 31.46% felt that it was “Not Essential” or even “Necessary” for the border to be secured. Trump, Pelosi, Schumer Fight on Live TV! Wow! Trump, Pelosi and Schumer get into a fight on live TV about funding for the Border Wall! Click Here for a Longer Clip where Schumer tell Trump they will not fund the wall. 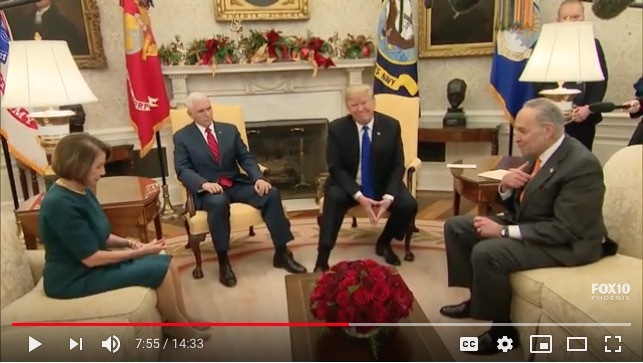 Click Here for the entire exchange where Pelosi and Schumer tell Trump that walls don’t work and much more! Call the White House Switchboard NOW at 202-456-1414 and ask them to note that you support President Trump’s decision to shut down the government if there is no wall funding. Then tell them that not only should he shut down the federal government, EVERY “non-essential” government employee that is identified in the shut down should have their job eliminated immediately!!! Watch the video and listen to the idiotic arguments by Pelosi and Schumer claiming that imaginary “experts” say walls don’t work. It’s real simple – NO WALL FUNDING, no Government funding. When they try to scare you about how “cruel” it will be to have a shut down at Christmas time LAUGH IN THEIR FACE and expose them for the frauds that they are! Like we don’t know that nothing important gets shut down and the laid off employees get a PAID VACATION and all there wages back at the end of the shutdown. You can tell by how much Pelosi and Schumer keep saying they don’t want a government shutdown that they will cave if the President holds firm. He will hold firm if he has our support! Call the White House Switchboard NOW! BTW, I have confirmation that our ad was seen in the White House. Don’t know for sure if the President saw it or not, but his staff definitely did. I also know lots of “Republican” Congressmen saw it. Our timing could not have been better! Thanks to all of you who shared it and donated to help pay for the ad. Please watch this important video that explains how Robert Mueller’s thugs are using KGB tactics to convict innocent people of non-crimes in an effort to force them into providing false testimony against President Donald Trump. Jerome Corsi is an American Hero. We must stop this insanity! President Trump must release the Documents requested by Congress and Whitaker must appoint a 2nd Special Counsel to Investigate the DOJ, the FBI, the State Department, the Clinton Foundation, Uranium One, Fusion GPS, Crowdstrike, the Unmasking, the Obama Administration’s spying illegally on American Citiizen’s and the Trump Campaign, the involvement of Britain and Australian Intelligence services in trying to rig the election for Hillary. We DEMAND Equal Justice for ALL! We will NOT be 2n Class Citizens in our own nation.